-Comfortable 5 In. Thick Innerspring Mattress (Included With The Bed). -4-Dual Wheel Casters For Easy Movements. -1 In. Sturdy Tubular Heavy-Gauge Steel Frame. 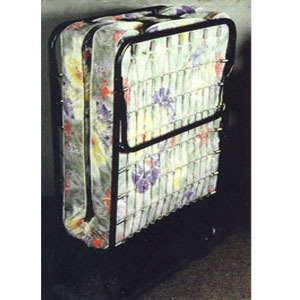 -Manufactures Recommended Weight Capacity is 275 lbs. -4 Rubber Leg Caps Protect Surfaces. -Open Size: 74 In. (L) x 31 In. (W) x 15.5 In.(H). -Folds To 32 In. (H) x 31 In. (W) x 13 In. (D) For Easy Cot Storage. - We recommend you use Cot Size Sheets but Standard Twin Sheets will fit. If Mattress Cover Is Needed, Please Order The Cot Size.